Oddsmakers say Alabama is historically great and point spreads in their games have been inflated. 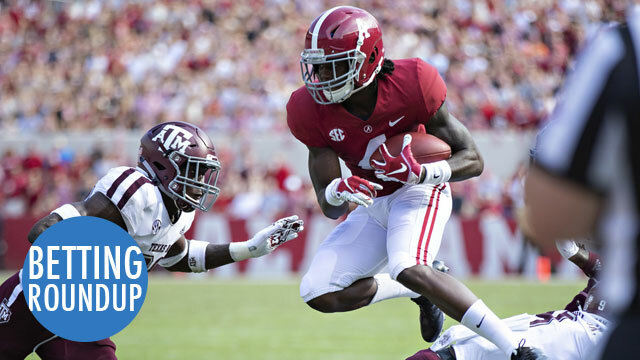 Ed Salmons, head oddsmaker at the Westgate SuperBook, rates this year’s Alabama team a full five points higher than last year’s championship team … which holds the highest mark in his 15 years of computing power ratings. “There’s really no way to stop these guys now,” Salmons told ESPN. The Crimson Time covered their first three games by a combined 58 points, the largest margin in the country. Consequently, the house has started charging a “Tide tax” on Alabama to offset the interest it draws at the betting window. The Buffalo Bills 27-6 win at Minnesota pulled off the biggest upset in the NFL in 23 years. The U.S. House of Representatives held a sports betting hearing yesterday. Chairman Jim Sensenbrenner (D-WI): “I think the one thing that all of you agree on, is that for Congress to do nothing is the worst possible alternative. A lawsuit is postponing legal sports betting in south New Jersey. Months after the U.S. Supreme Court cleared the way for legal bets on professional and college sporting events, owners of the only destination state legislators deemed eligible for a sports betting parlor south of Trenton and outside of Atlantic City are locked in a court scrum. In one corner is Cherry Hill Towne Center Partners, a Piscataway-based real estate developer that owns all but 10 of the 600-acre former Garden State Racetrack property. In the other corner is GS Park Racing, a partnership of gaming companies, including Greenwood Racing, a co-owner of Freehold Raceway and the Parx Casino and Philadelphia Park horserace track in suburban Philadelphia. The developers are suing the gaming company in federal court to invalidate a deed covenant that gave it exclusive rights to operate betting facilities on the former racetrack property. The lawsuit claims the gaming company has intentionally not opened an off-track betting parlor here because it feared it would compete with its other gaming properties. Sports leagues haven’t taken any major actions against sports betting. A professional sports bettor spoke out on why he isn’t a fan of legalized sports betting. The worst part of it is that the day-to-day variance isn’t my main concern anymore. What really keeps me up at night is the fear of losing my edge. I’ve been asked many times what my biggest fears are for the future of sports betting, and my answer is always the same: change.